Peter Brears’ robust discussion of the early history of the Cornish pasty, indeed whether we should call it Cornish at all, provoked other comments, none more extended than one from Barbara Santich in Adelaide, South Australia. She gathered a full sheaf of local press cuttings concerning the pasty, as well as citing these, her own words, from her book Bold Palates: Australia’s Gastronomic Heritage (Wakefield Press, 2013): ‘In domestic kitchens, however, individual small pies were a long way behind pasties in popularity. While meat pies were typically the product of professional bakers and small-scale manufacturing, pasties – specifically, Cornish pasties – were more often associated with home cooking. In cookbooks published in the first half of the 20th century, recipes for pasties outnumber those for small meat pies by almost ten to one. Like pies, pasties can be seen as a continuation of the centuries-old pie tradition, a raw meat-and-vegetables filling baked inside a pastry case that made it easy to transport and eat – and to reheat, on a shovel held over the fire. PPC’s most intrepid allotment-holder, Phil Iddison, sent me this report from his diggings in London. It runs as follows: ‘One by-product of harvests at my allotment in Richmond on Thames has been a steady stream of worked flint tools from the Stone Age. Most are found during the potato harvest when I sift through the soil to try and find every miniature potato to ensure that I do not get rogue potato plants appearing amongst the next year’s crops. ‘The majority of these tools are simple scrapers, a tool that has little application in the modern kitchen. We now use paring knives, graters and the micro-plane. Other tools are like small axes or pounders and one substantial specimen has a saw edge, perhaps for butchery. ‘One of the flints that I picked out of the soil in 2014 did not at first appear to be a worked tool. I put it to one side and only looked at it in detail this spring. ‘Consultation with a local archaeologist confirmed that these were tools of Mesolithic and Neolithic types and probably more than 4,000 years old. As they were found in topsoil, an un-stratified horizon, specific dates cannot be given. ‘He alerted me to a particular type of tool of which I have collected several specimens. These tools have a prominent notch created on one edge. This is thought to be a specialized scraper, for instance to strip bark from twigs to eat and use in medicine or perhaps craft work. There is palaeofaecal evidence for the consumption of bark in the Neolithic diet. ‘This latest flint has two of these notches of different sizes and there is another small notch which looks man-made. It also has a right-angled corner which has both edges re-touched to create serrated edges for cutting or scraping. This small tool, only 40 mm long, has three or four functions! It is not a classic tool with all surfaces worked to create an aesthetically appealing object. It is a flake from a larger flint mass and still has an edge displaying the weathered cortex material of the parent stone. This is the area that is under the user’s thumb, providing a natural non-slip surface, an added but significant benefit if the tool becomes wet in use. The alignment of the cutting edges on the tool indicates that it was made for a right-handed user. It is a very practical tool. ‘How do I know that it is an ancient tool and not just an accidental fragment of rock? There are three percussion bulb impressions on the flint surface that confirm deliberate pressure flaking by one of our antecedents to create the shapes, surfaces and edges to make this into a versatile and useful implement. The large bulb on the reverse of the tool separated it from the parent flint. Another created the larger notch. The third laid the basis for the sharpened corner. A major retouch created the smaller notch. There is also the comprehensive edge re-touching that does not happen accidentally. Very large academic conferences are interesting phenomena, and this Leeds event is no exception. 2016 will see food at the centre of things. I repeat the latest release: ‘The twenty-third International Medieval Congress will take place in Leeds, from 4–7 July 2016. … The IMC seeks to provide an interdisciplinary forum for the discussion of all aspects of Medieval Studies. Paper and session proposals on any topic related to the European Middle Ages are welcome. However, every year, the IMC chooses a special thematic strand which – for 2016 – is ‘Food, Feast & Famine’. The theme has been chosen for the crucial importance of both phenomena in social and intellectual discourse, both medieval and modern, as well as their impact on many aspects of the human experience. ‘Food is both a necessity and a marker of economic and social privilege. Who cooks food, who consumes it in the Middle Ages? How and what did people from different social levels or religious commitments eat? How did eating change? How were these issues contested and represented? What does food reveal about differing aspects of medieval society and culture? ‘The aim is to cover the entire spectrum of famine to feast through multi-disciplinary approaches. Study of the medieval economy raises issues about standards of living and nutritional health. Both archaeological as well as textual evidence have been used to explore crop yields, agricultural methods, transport problems, dearth, and famine. Geographical and social variations in diet are important for understanding medieval taste and the era’s definitions of sufficiency and luxury. Food is an expression of international relations and trade, as shown in the intercultural influences between Christian Europe and Islamic Spain, North Africa, the Eastern Mediterranean, and India. ‘Across medieval Europe the acquisition, preservation, and storage of food was a struggle for much of the population, but food consumption was also a means for a clerical and noble elite to display taste and ostentation. In popular culture, feasting is perceived as one of the major activities of the medieval elite. The religious significance of food and fasting in the Middle Ages was part of Christian, Muslim, and Jewish practice. Fasting and food had wide-ranging interconnections with piety and charity, and could involve renunciation of an exceptional intensity. Spiritual and physical nourishment and its absence can be explored in many disciplines from the theological, legal, and literary to the art-historical and linguistic. …[A] Special Thematic Strand ‘Food, Feast & Famine’ will be co-ordinated by Paul Freedman (Department of History, Yale University).’ See for more information. Ken Albala has notified me of the following: ‘We are excited to tell you about a new degree program we are offering: Master of Arts in Food Studies. The program will be offered at University of the Pacific’s state-of-the-art new campus in the SoMa district of San Francisco in fall 2015. The faculty includes world-renowned academic and working professionals. The eager foodist will soon have a calendar full of every sort of conference, symposium and assembly – and an empty bank account. Máirtín Mac Con Iomaire has kindly sent me notification of this excellent event in Ireland. His message runs as follows: ‘Just a brief note to remind people to put the 31 May–1 June 2016 in your diaries for the third biennial Dublin Gastronomy Symposium. The theme for 2016 will be Revolution which can be interpreted in the broadest sense. Of course we will be celebrating the 1916 Revolution in Easter 2016 here in Dublin but for the symposium authors might like to write about revolutionary events in the food world – including but not limited to the following topics: food and war, trench food, siege food etc. ; impact of French revolution on restaurants; American Revolution – Boston Tea Party; the green organic revolution; the industrial revolution and its effect on food; health food revolution; influence of service à la russe; who were the revolutionary chefs and food producers of the past and who are the present revolutionaries? ; revolutionary food writers; revolution in culinary training; can revolution unify citizens under a common cuisine? – Italy and Garibaldi. While we are at it, I should also tell you of this gathering, scheduled for 15–16 January 2016, to discuss the topic ‘Fire, Knives and Fridges: The material culture of cooking tools and techniques’. They continue: ‘This year’s topic is inspired by the renewed interest in traditional cooking and preservation techniques, such as baking and fermenting, but also by innovations like sous-vide cooking and molecular gastronomy. Since prehistoric times humans have used tools, such as fire, grindstones, and knives to transform raw ingredients into edible food. Anthropologists such as Claude Lévi-Strauss and Richard Wrangham have suggested that it is the discovery of cooking which sets humans apart from apes and makes us a “cooking animal”. In their view, advancements in the technology of cooking mark the human transformation of (raw) nature into (cooked) culture. It is with great regret that I note the death of this wonderful journalist whose presence so enlivened our visits to the Oxford Symposium in years gone by. It was indeed people like Ann Barr that made the Symposium so unique an event. She will be for ever remembered by her Official Sloane Ranger Handbook (1982), written with Peter York, and her Official Foodie Handbook (1984), written with Paul Levy. Each combined utility with the sharpest of wits. The passage of the last year or two has been soothed by immersion in this Norwegian author’s My Struggle so skilfully Englished by Don Bartlett (now up to volume 4 out of 6). I only mention it here because it is full of incidental information about food and cookery in Norway and Sweden over the last few decades. Indeed, I confess that I am sometimes as alert to the local and factual colour as the literary achievement. Just wonderful stuff. Prospect Books is about to bring out the fourth volume of this series of con­ference papers. Not before time, because the conference it records was held in 2010, but due to no lack of vim and vigour on the part of Prospect Books. It is available from the website (£30, but £22.50 at present). My ambition had always been to assemble a collection of about twenty of these volumes, by which point something of value and utility might have emerged, but unfortunately it seems impossible to persuade the participants that publication is a good idea and worth their investment of time and effort. I can only deduce either that young archaeologists (for the participants in these conferences are all either postgraduate students or people at the beginning of their careers) are not very energetic or that the university research assessment process (by which funds and prestige are allocated) does not think such volumes of much value. Geraldene Holt has sent me the following press release: ‘The £2000 Jane Grigson Award, created in honour of the twenty-fifth anniversary of Jane Grigson’s death, will be made to a writer new to food writing (although they may have written on other subjects) who has already received a commission from a publishing house. In the spirit of Jane’s writing, the award will be for a non-fiction book on food in the widest sense, from any genre – cook book, memoir, travel, history – so long as the primary subject is food. ‘The Jane Grigson Award is unusual in rewarding a promising new writer ahead of publication in order to help them discover ‘one thing, one reference, one passage... that gives you the theme, that shows you the way’. The intention is that the winner will use the £2,000 sum to fund further travel or research in the vital time between gaining a commission and delivery of the manuscript. I had not come across this website before and I recommend it, if only for its useful gathering of Internet links to texts of old English cookery texts. It is, however, much more than that, having at its heart an encyclopaedia of English dishes with commentary (sometimes), recipes from old texts (sometimes) and pictures (sometimes). There is little about the creator of this great work save that his name is Glyn Lloyd-Hughes, the author/creator of The Squashed Philosophers (Derwent Press), Squashed Dickens, and The Hundred Books: All the Stuff You’re Supposed to Have Read. Along with the cereal café in Shoreditch, hipsters of London have banded together to support a place devoted to porridge. However, rather than merely serving bowls of breakfast all day, they have taken any old grain as their base material and added the world’s larder to it. This all occurred in springtime in Hackney and is about to reappear as a pop-up in Victoria (16 Terminus Place). We may think of porridge as British, the menu is anything but: at lunch you can have ‘risottos’ of chicken congee on barley, or asparagus pea and mint on buckwheat; or there are salads of cajun chicken with quinoa, watercress, broccoli and feta, or kale, avocado, quinioa, broccoli and cashew nuts. Interestingly, from any menus that I have seen, there have been few explorations of British ways with grain (other than porridge) such as frumenty or gruels or sowans, etc. The first months of the year have seen us frozen like rabbits in headlights as we experienced the full enormity of the state’s new subsidy system for English farms: the Basic Payment Scheme (the Single Farm Payment that was). It was intended that the whole process should be online, but first, of course, you had to register (in the way of such systems, it disregarded the fact that you had been registered for the previous regime, run by the same people from the same desks, for years beforehand). You could only register via a mobile phone. We cannot get a mobile signal here in Allaleigh. Everything ground to a halt. And then they worked out a workaround. The next stop was navigating the form itself. Well, that didn’t work either, nor for thousands of other, bigger farmers. So they had to call a complete halt and convert it all back to paper. You could follow the whole thing in Private Eye – and it was true. Having been sent the paper material, we were then able to complete the submission by clicking a single button online, so all ended happily, for this year at least. We sometimes question whether we, as very small landholders, deserve such a generous payment but comfort any tenderness of conscience by reckoning that they will soon exclude those with fewer than 25–50 hectares. Who knows? On the agricultural front meanwhile, life has been made much easier by the accession of my son-in-law Paul Adams to the fray. 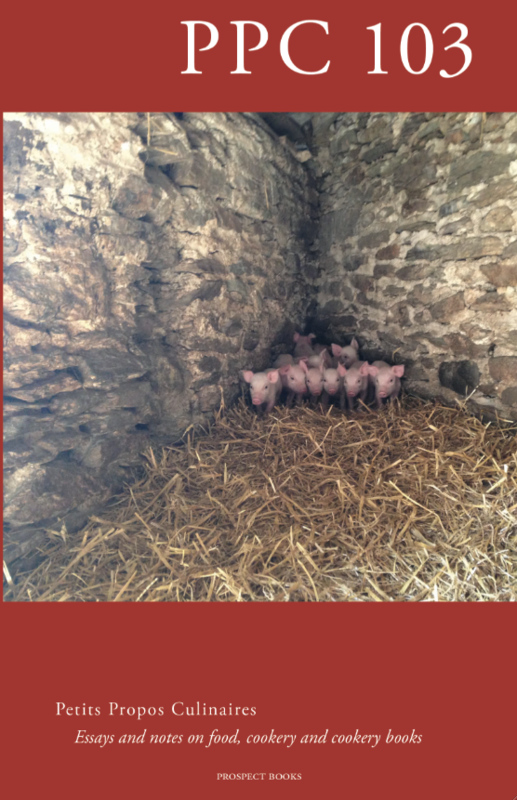 We have increased the flock of sheep and had a good lambing, and we have a new sow, Peggy, and a new boar, Rufus. 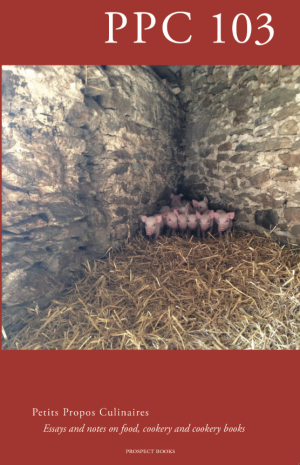 Peggy had her first litter at the beginning of May, ten piglets in rude health. Isabella soldiers on, with a smaller litter last time of four. Here in Devon we have got into quite an annual rhythm of making cider (in bountiful years) and apple juice, even if drinking the stuff is more difficult (cider, that is, for the apple juice goes down throats of all ages) – not so much because it’s disgusting (although I will not make great claims for it save that it tastes as clean as a whistle), but because there is so much of it and, frankly, we prefer red wine. However, there are flutterings in the dovecotes of small commercial cider makers as a result of the request from the EU that the British government ceases to allow producers (of less than 70 hectolitres of cider in any one year) exemption from excise duty. This may be a very large nail in the coffin of many an artisan cider for the exemption saves them up to £2,500. Having just finished reading Éric Zemmour’s Le Suicide français, a glorious, one-sided paean to reactionary nationalism (much more forceful than any arguments from UKIP), I am tempted to align myself with the critics of the Union, while wondering how the small cider makers of France may cope given they have lived without such a subsidy for all these years. The several series of radio comedies by Miles Jupp portraying the life and recipes of the cookery writer Damien Trench have been the one thing that has got me out of bed of a Monday morning. Their waspish accuracy has me giggling all the way to lunch. I even wrote to his agent to see if Prospect could print the scripts (he never replied, doubtless expecting far, far better things). Then there was a short set of programmes on television which pleased but did not quite delight as the radio had done. All I can say is that when they reappear, they are essential listening. The back alleys of research in newspapers and documents never run straight and the indefagitable Colin Smythe, whose discoveries about the career of Charle Elmé Francatelli have occupied pages of the last two issues, has more to add. The difficulties surround the precise date at which Francatelli gave up his job at the Reform Club. Comments by George Augustus Sala had encouraged him to believe it was 1862 or 1863, but he now thinks Sala’s memory was defective. Therefore, the definitive version of Colin Smythe’s paragraphs on this particular detail should now read as follows: ‘The title page of the 1867 edition of the Cook’s Guide states that Francatelli stayed at the Reform for seven years, i.e. till 1861, and in spite of Sala’s recollections – at the time of his writing his memory was obviously failing – he could not have met him there as he was only elected to the Reform on 13 March 1862, over a year after Francatelli’s departure. The Reform Club had advertised in the Morning Post for a new Steward and Chief Cook on 21 January 1861, so Francatelli must have left by then or been working his notice.